Jeffrey Gundlach’s $1 million reward for his stolen painting by Piet Mondrian is believed to be the largest ever offered for a single painting, according to art experts. Gundlach, a bond investor, announced at a press conference yesterday that he’s offering $1.7 million for the return of his entire art collection, which also includes works by Jasper Johns and Richard Diebenkorn. Of that amount, $1 million is for Mondrian’s “Composition (A) En Rouge Et Blanc” alone. The reward tops the bounty offered by Charles Lindbergh and his wife for the safe return of their kidnapped child in 1932, which reached $75,000, or $1.261 million in today’s dollars. While museums have offered millions of dollars for the return of stolen collections, Gundlach’s offered reward far exceeds the amounts commonly offered by private individuals for artworks. “I don’t know of other cases where an individual offered that much for a single piece,” said Mark Dalrymple, director of Tyler & Co, the British loss-adjuster firm that specializes in recovering and valuing stolen art. Dalrymple said the largest reward he’s ever offered for a piece of fine art was $250,000 for the return of two Turner paintings to a German owner. He said an undisclosed reward was paid for paintings and they were eventually returned several years after they were stolen. Rewards for art are typically offered by the insurance company rather than the owner, Dalrymple said. 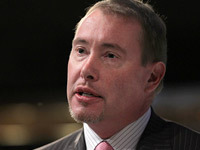 Gundlach declined to comment on whether he had insurance. While rewards are sometimes successful, some law-enforcement officials question their effectiveness. The Isabella Gardner Museum in Boston has offered a $5 million reward for the return of 13 works of art stolen in 1990. The pieces – which include a Rembrandt and a Vermeer – remain missing. AXA Art Insurance is offering what it called a “substantial” reward – though the amount wasn’t disclosed – for two artifacts stolen from the the Montreal Museum of Fine Arts. Art experts say rewards also have to be low enough that they don’t become an incentive for similar crimes. Here are five of the other big rewards offered to help solve a crime or find a person (not including whistleblower cases). $25 million, capture of Osama Bin Laden. Under its “Rewards for Justice” program, the United States offered $25 million for information leading to the capture of the Al Queda leader. Because the information leading to his capture didn’t come from an informant, it was never paid. $2 million, Whitey Bulger’s arrest. The FBI paid a reward of $2 million to a former Miss Iceland who tipped off the FBI to the location of the alleged former mobster. $1.2 million, Charles Lindbergh’s kidnapped child. The Lindbergh family offered a $50,000 reward for the safe return of Charles Lindbergh Jr., who was famously kidnapped in 1932. New Jersey law enforcement offered $25,000, making the total reward of $75,000—or $1.26 million in today’s dollars. $685,000, Pablo Picasso painting. A portrait of Picasso’s muse Dora Maar was stolen from a private Saudi yacht off the coast of France in 1999, and the reward of $685,000 was offered. It’s unclear if it was ever paid.